b) energy use by the water customer, known as end-use. End-use represents the amount of energy used by the customer for heating and pumping water in a home, office or facility. 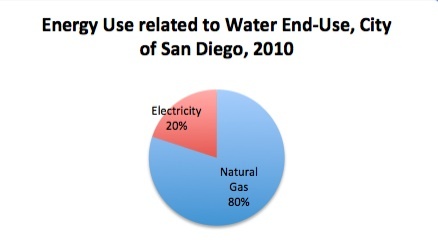 In 2010, per capita water use (end-use) in the City of San Diego was about 125 gallons/day. Total water use has remained steady since the mid 1990’s, decreasing only slightly within the last few years. Also, per capita water use is relatively independent of rainfall. 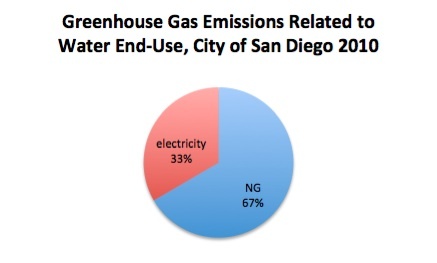 How does the City of San Diego compare with the state of California as far as energy use and GHG emissions within the water-energy nexus? Much of the water supplying San Diego travels a considerable distance. 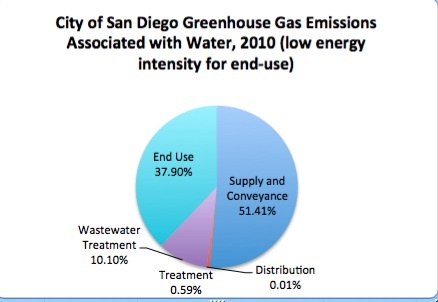 As a result, the relative fraction of energy associated with end use in San Diego is below the sate average. 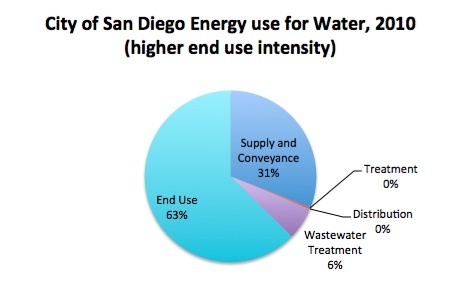 However, even with grater up-stream energy demands for the water supply, end use remains the largest sector of the energy water nexus in San Diego. Furthermore, because little can be done to mitigate the physical distances water must travel to reach San Diego, end-use energy consumption still provides the greatest opportunity for conservation and efficiency improvements. About 80% of end-use energy is natural gas. This is in contrast to each of the other sectors of the water-energy nexus, which are driven largely by electricity. Therefore, reductions in end use consumer water consumption, as well as end use efficiency improvements, would correspond to major reductions in natural gas consumption. Precisely determining what fraction energy use within the water-energy nexus is associated with end-use can be difficult because the key variable, energy intensity, varies from study to study. Two recent end-use energy intensities studies include a case study in 2004 for the San Diego region, and a California-wide study in 2008. The end-use energy intensity varies significantly between the two studies. The 2004 San Diego case study estimated 11,969 kWh equivalent per million gallons while the 2008 state-wide study estimated 19,715 kWh equivalent per million gallons. Applying the lower 2004 energy intensity to San Diego data shows that about 50% of total water related energy is due to end-use. 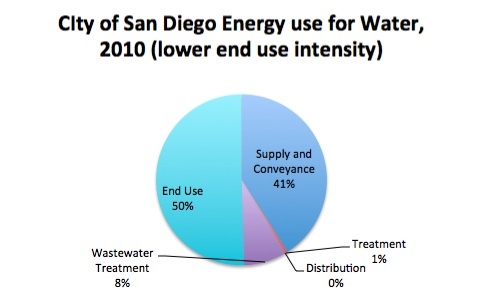 Applying the higher 2008 state-wide end-use intensity for the City of San Diego suggests that end use represents about 63% of the total energy use within the water-energy nexus. Electricity use within sectors of the water-energy nexus is assumed to have a GHG intensity of 800 lbs/mWh. However, the chief greenhouse gas emitter within the water-energy nexus depends on which end-use energy intensity is used. Using the lower value from the local case study indicates that the supply and conveyance sector has a larger than average fraction of greenhouse gas emissions. This aligns with intuition since water must be conveyed a longer than average distance to supply San Diego. Additionally, if the end-use energy intensity from the state-wide study is used, end-use appears to be the largest greenhouse gas contributor. However, uncertainties within the estimates and a dynamically and rapidly changing energy landscape require additional study before concrete conclusions can be made regarding relative energy consumption between the sectors. Also important to note, is that because most end use energy demand is supplied by natural gas, most consumers derive no benefit to their end use energy-related emissions from state-wide electricity standards like the Renewable Portfolio Standard. The following shows a greenhouse gas emissions breakdown that is largely a function of consumers using either electric or natural gas water heaters. 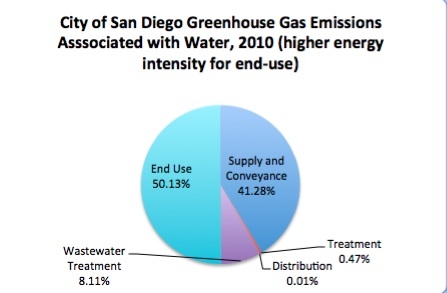 Policymakers focused on optimizing energy use within San Diego’s water-energy nexus should recognize the while energy use and corresponding greenhouse gas emissions for the supply and conveyance sector are larger than the California state average, relatively little can be done to shorten San Diego’s proximity to water sources, or improve the conveyance system’s overall efficiency. However, local policymakers can have an impact on local end use water consumption and home water appliance energy efficiency. This entry was posted in Energy, Energy Efficiency, Greenhouse Gas. Bookmark the permalink.